Saturday was a special day for dogs and the people the dogs walk. Thanks to years of work by the Recreation and Parks Advisory Board, a grassroots petition drive from dog lovers Pam Moore and Michele Johnson, and the hard work of staff, particularly in Recreation and Parks, we have a dog park. The Park Forest Bark District officially opened Saturday. At one point, more than 35 dogs were running happily in the park, and there was not a bark to be heard. Honestly. The dogs were quite content to run in the sun, sit in the shade, or steal a sandal from a resting human and make a game of playing keep-away. That happened to a friend of mine. Poor JoJo Martin had to wait while one of our four-footed friends ran off with her sandal and had a grand time holding onto it for a spell. The animal was quite friendly, and just being chased, knowing that he could out-run any of us trying to get the sandal back. In the end, the dog allowed JoJo to take her sandal back, hopefully with only a few chew marks. Saturday was wonderful. Unfortunately, I had a not-so-incredible experience at the same park Sunday. I arrived late in the afternoon, parked my car, and began walking my dog to the entrance along the wood chip path. There was a family in the Bark District with their dog, a couple with their children. As we approached along the fence, the dog, a black pit bull, charged at us, snarling and lunging at my dog. The animal was not being friendly. The dog was growling viciously, trying to get at my dog. As we continued to walk toward the entrance to the park, their dog became more aggressive, actually trying to jump the fence. I was getting scared that he would be successful: a couple of times, his front legs made it well over, but he kept falling back. The couple looked on, and the father smiled and told me not to worry, “He’s got some pit in him. He doesn’t like dogs!” Meanwhile, the dog continued attempting to jump the fence, all the while snarling. One of the children, a young man about 12-years-old, ran to the dog to try to bring him away from the fence, back to the rest of the family seated at the picnic table. The young man was unsuccessful, trying to grasp the dog’s chain collar. During one of the dog’s many attempts to jump the fence, the child grabbed at the collar while the dog was airborne. The dog quickly turned its head and took the young man’s hand in its mouth. Message was clear: leave me alone. The dog would not respond when the owner called it. The animal had one purpose: jump the fence, and get that dog. I stayed outside the fence with my dog. The adults in the family were still trying to reassure me that their dog was fine, “He just doesn’t like dogs.” The father sent his son to open the outer gate for me, and then the gate to the other half of the Bark District. We entered that section of the park, safe from the snarling pit bull. If you’ve seen the park, you know, while our Recreation and Parks Department did a great job, the front entrance is too low. Yes, you are supposed to have a key card to get in the park. Right now, you only have to reach over the fence to gain entry. I asked the owners if their dog was registered at the park. At this point, their tone changed. They became irate with me, assuring me it was none of my business. I disagreed. Registration at the park requires that the dog have a number of shots, and I wanted to make sure their growling and snarling animal at least had its shots. So I asked, “Does your dog have its shots?” I told them I was concerned as their dog was acting like a wild animal. Again, I was told it was none of my business, and who was I anyway? The couple demanded to know my name, so I told them who I was, and my affiliation with the village. They then suggested in no uncertain terms that the only reason I was questioning them was because of their race, and further suggested that this was typical of Park Forest. This was unfortunate. It was obvious that our conversation from that point was going nowhere, and I had no desire to continue our conversation at that point, especially in front of children. I walked to the other end of the dog park and called a friend. A short while later, the family left. Another family arrived with their dog, and we chatted. I shared my experience with them. They had seen the other dog trying to jump the fence. 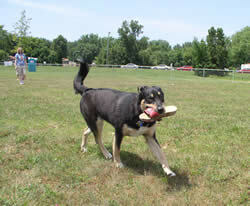 Here’s the issue: if your dog doesn’t like other dogs, don’t bring your dog to a dog park. That’s it. I called a friend of mine, Bob Nixon. Bob and his wife do animal rescue, and own several dogs, several cats, and a few parrots. I don’t know the dog whisperer, but I know Bob. I thought perhaps the issue was that this was a pit bull. Bob assured me that was not the case, “Some dogs just don’t like other dogs.” The breed was irrelevant. Bob says he has three pit bulls, and they get along wonderfully with his other animals. He does have one hunting dog that doesn’t care for other dogs, so they don’t push it. I asked Bob if it was possible that this particular pit bull had been trained to fight other dogs. He said that was unlikely; dogs that are used in fights are usually much better trained. When the fight is over, the owners need to get control of their animals, if still alive. This dog would not listen to anyone in the family. Besides, Bob told me, even transporting a dog used in fights is a felony. Dog fighters tend to avoid daylight, exposure, and dog parks. Bob stressed again that a dog park is no place for a dog that doesn’t like dogs. It just doesn’t work. At the very least, these animals should be muzzled. He did say some dogs can be socialized over time, but some never take to other dogs. Posting the rules at the park is a good idea as well. Some residents have mentioned that, and I’m sure that’s all coming. This is only the beginning, and we have very creative staff. But this is only the first week the park has been open. The Recreation and Parks Advisory Board, the Recreation and Parks Department and other staff members are all to be commended on bringing to the residents a wonderful addition to Park Forest. I’ve heard many positive things about the park. People are very, very pleased that Park Forest built this park. What I remember most from the weekend is the ribbon cutting, more than 35 dogs playfully running around the dog park, and not a bark or a growl. And poor JoJo, standing one sandal shy. The writer is a Village Trustee in Park Forest, and a dog owner.